Named for an ancient Egyptian city, Luxor is committed to its theme! The resort is most famous for its distinctive and iconic 30-story glass and steel pyramid, topped by the brightest beam of light in the world. Luxor is known for being a real “bang for the buck” property: you get a lot without blowing your family’s vacation budget. Luxor is located at the south end of the Las Vegas Strip. A tram carries guests between the adjacent Luxor, Mandalay Bay, and Excalibur properties, as do air-conditioned corridors. Rooms start at 420 square feet with one King bed and three-person maximum occupancy. Rollaway Check-in time is 3:00 PM and check-out time is 11:00 AM. Great for families with older kids! Step back in time with over 250 genuine artifacts recovered from the RMS Titanic wreckage deep in the North Atlantic Ocean. The pieces of history along with painstakingly recreated scenes from the ship create a highly immersive and educational exhibit that’s renowned all over the world. Titanic: The Artifacts Exhibit is open daily from 10:00 AM to 10:00 PM. Blue Man Group simply must be seen to be believed. This legendary show is a sensory delight with music and humor that’s a blast for all ages. Leave your expectations at the door, bring the kids, and see what it means to live life In Full Color. Where else can you and your family go swimming in the shadow of a pyramid? The Luxor’s pool complex spreads over 19,000 square feet, with four pools to choose from. It’s a true oasis in the desert! Enjoy complimentary towels, lounge chairs, and poolside beverage attendants. The Luxor pool has a full-service menu that’s perfect for a picnic. Cabanas are available for rent. The pool is open daily from 9:00 AM to 5:00 PM. Knights joust and compete amid a special effects and pyrotechnics bonanza. Guests sit in a 360-degree arena and enjoy a three-course meal while taking in a truly epic story of deceit, honor, and chivalry. 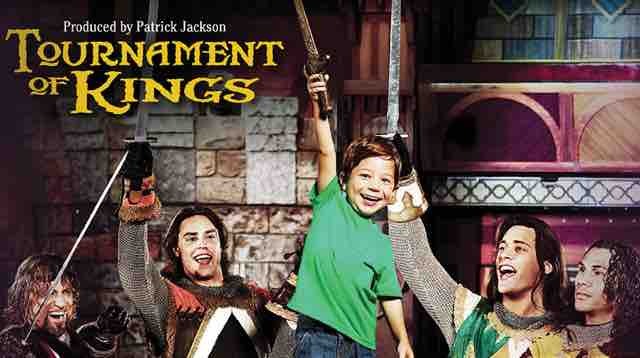 Kids will love the action and eating medieval-style: with their hands! This world-famous aquarium houses over 2,000 aquatic creatures, including its namesake sharks, stingrays, turtles, piranhas, and a Komodo Dragon. It’s a must-see for Las Vegas visitors of all ages! Daily feeding experiences and even Shark Diving are available! Your family will love diving deep into a fun, educational, and unforgettable adventure! First seen on America’s Got Talent and then over 1 billion times on YouTube, Murray The Magician will wow all ages with hilarious pranks, eye-popping illusions, and fun audience participation. Showtimes are 5:00 PM Sunday through Wednesday and 7:00 PM Thursday and Saturday. Conveniently located on the casino level, this tasty bistro is open for breakfast and lunch daily. Breakfast specialties include the Pyramid Pancake Stack, chicken & waffles, and omelets. For lunch, kids will love Hot Cheetos-breaded chicken fingers or grilled cheese, while adults will enjoy pan-roasted chicken and BLTA (bacon, lettuce, tomato, and avocado). In-room delivery service is available. Pyramid Café is open 7:00 AM to 1:00 PM Monday through Thursday and 7:00 AM to 2:00 PM Friday through Sunday. The Backstage Deli is perfect not only for breakfast, but also for dinner before the show. The fare is New York-style delicatessen classics with a modern twist. Try the A Lil Bit of Everything bagel sandwich to kickstart your day, or a tasty Dem Apples salad for a fresh lunch. There’s plenty of sandwich options for all ages, and all sandwiches can be made into wraps upon request. Backstage Deli is open 24 hours. This casual and delicious buffet offers enough variety to satisfy even the most finicky eaters. Bring your appetite and dig into salad bar, pizza station, carving station, omelet station, and dessert station (including sugar-free desserts suitable for those with dietary restrictions), this buffet has something for everyone! Special pricing is available for children 5-11 years of ages. The Buffet is open 7:00 AM to 10:00 PM daily. Other great dining options at Luxor include Rice & Company, Public House, TENDER Steakhouse Luxor Food Court, and Diablo’s Cantina. Luxor does not offer on-sight childcare. Contact the concierge for information and assistance in booking a babysitting service. Luxor participates in MGM’s M Life Rewards program. Members earn points and perks with every dollar spent at participating properties. Luxor charges a daily resort fee of $39.68 that covers phone calls, internet access, and fitness center access. Summing up: Is Luxor Child-Friendly? Luxor is an affordable vacation destination. The giant pool complex is a big bonus for families with kids who just can’t get enough of the water. The ancient Egyptian theme doesn’t commit as much as it could for maximum atmosphere; the theme can at times feel like it’s more style over substance. That said, your family is still staying in a pyramid. Where else on Earth can you say that?